For at least a decade before the California gold rush of 1849, there was a growing migration of settlers to the West. Most of these pioneers were bound for the rich farmland of the Willamette Valley in the Oregon territory and followed a route which stretched over 2,000 miles from Independence, Missouri to Fort Vancouver, now Vancouver, Washington. Crossing the continent on this Oregon Trail was an arduous undertaking in the 1840s, made even more perilous by non-existent roads and the constant threat of violent storms, prairie fires, dysentery and cholera, not to mention sporadic Indian attacks. Travelers on the trail organized themselves into small companies to better fend off the many hazards en route. Due to the rigors of the trip, many did not make it the whole way. But the promise of a new beginning was at the end of the journey, and this spurred on a continuing exodus. As difficult as it was, more than 6,000 people used the trail by 1846. Only the discovery of gold in California in 1848 reduced the flow of traffic. 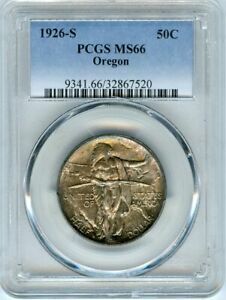 In 1926, a New York corporation calling itself the Oregon Trail Memorial Association, Inc. petitioned Congress to authorize a half dollar to "commemorate the heroism of our fathers and mothers who traversed the Oregon Trail to the far West with great hardship, daring, and loss of life, which not only resulted in adding new states to the Union, but earned a well-deserved and imperishable fame for the pioneers." The Association, whose president was the pioneer Ezra Meeker (who made the journey in 1851), ostensibly sought to use the funds raised to erect monuments along the route. Subsequent events proved that the promoters had little more than unbridled greed on their minds. 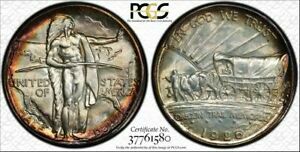 Congress, however, was apparently satisfied that the commemoration was of national significance, and passed legislation on May 17, 1926 authorizing the coining of "no more than six million" coins. Thus, the Oregon Trail Commemorative Half Dollar was born - along with the beginning of a speculator rush for limited edition coins. The design was completed by the famed husband and wife team of James Earle and Laura Gardin Fraser. 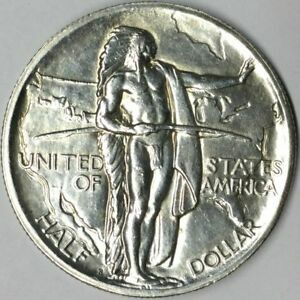 Mrs. Fraser had designed several commemorative coins, notably the 1922 Grant half dollar and dollar, and her husband, who is credited with the obverse design of the Oregon Trail half, is remembered for creating one of the most memorable of all modern coin designs, the Buffalo nickel. The obverse of the coin (which was considered the reverse by the Frasers, but not by the Mint) depicts a Conestoga wagon drawn by oxen, heading into a setting sun. The motto IN GOD WE TRUST arcs above at the rim and below the wagon is OREGON TRAIL MEMORIAL and the date. The designers' initials appear behind the wagon. The reverse features a dramatically rendered Indian, standing erect with outstretched arm as if to say "stop." The Indian is superimposed on a map of the U.S. depicting a line of Conestoga wagons heading West. 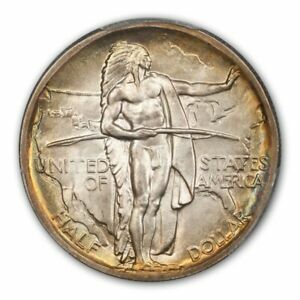 The inscription UNITED STATES OF AMERICA is placed around the Indian, and HALF DOLLAR arcs below at the rim. 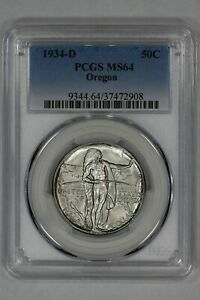 The overall design of the coin is considered one of the most beautiful and truly "American" in U.S. coinage. 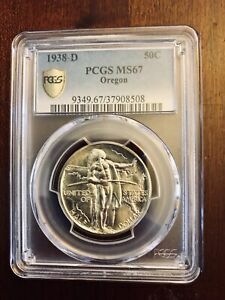 Enthusiastically approving the Frasers' design, the Federal Commission of Fine Arts (charged since 1921 with overseeing the design of coins and medals) sent the models directly to the Medallic Art Company of New York to make mechanical reductions. The hubs were then shipped to the Philadelphia Mint, and in September of 1926, 48,000 coins were struck, along with 30 pieces reserved for assay. This issue became known as the "Ezra Meeker issue," as it was struck 75 years after Meeker's initial trek along the trail. Meeker made the journey again in 1907, when he set out from his Oregon home, purportedly to scout for locations for commemorative plaques. The coins, sold at $1 each, became an instant hit with the public, so much so that another issue was prepared for emission from the San Francisco Mint. The Association's logic was that those who bought the Philadelphia issues would most certainly desire the San Francisco coins. October saw the first of 100,000 pieces from the western mint go to the Association for resale to the public (mintmarks appear to the right of the F in HALF). 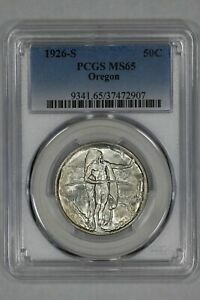 But enthusiasm quickly waned, and few coins sold at the issue price. The Treasury became aware of the unsold coins and ordered the Mints to cease production until all the 1926-S issues were sold, which explains why no coins were struck in 1927. Yet, the Association kept exerting pressure on the Treasury, which led to the manufacture of 50,000 coins in 1928. These were named the "Jedediah Smith Issue," as a tribute to one of the more famous Western explorers. By this time, the Treasury had seen the error of its ways and refused to strike any future issues. 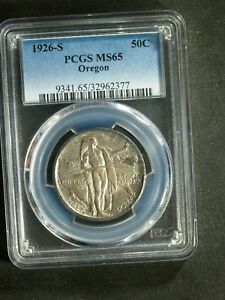 The 1928-dated coins remained in their vaults for another five years. 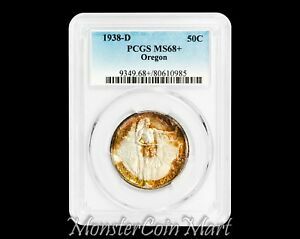 In 1933, the Commission again exerted considerable pressure to strike coins, and with the melting of the remaining 17,000 1926-S issues, paved the way for the release of the 1928 coins. 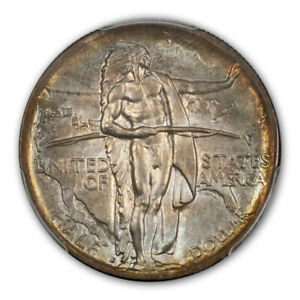 1934 saw the Denver Mint strike 7,000 coins, known as the "Fort Hall, Ft. Laramie and Jason Lee Issue." This pattern was repeated in 1936 in Philadelphia (10,000) and San Francisco (5,000), again in 1937 in Denver (12,000), and finally with a three-piece set containing one coin from each of the three mints in 1938 (6,000) and 1939 (3,000). The obvious abuses, profiteering and behind-the-scenes political maneuvering didn't sit well with collectors of the day, but the relatively low mintages of the later issues kept sales brisk. Sales to speculators were the rule, however, as individuals played leapfrog to get the new 1937 issues. The Association, who had previously given Scott Stamp & Coin the rights for distribution, again took over the sales of the later dates, decrying the greedy dealers trying to take advantage of the public. 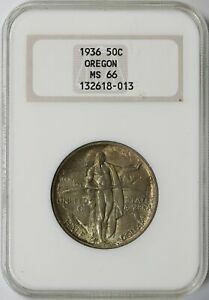 This arrangement did not work out as well as their initial distribution experience, and as late as 1943, other patriotic societies were trying to sell the coins to new buyers who were unaware of the earlier issues. 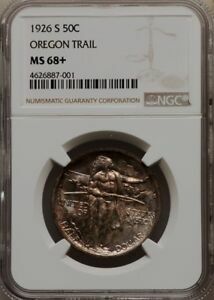 But when the last Oregon Trail half was struck in 1939, its on-and-off, fourteen-year run had witnessed a total of only 264,419 coins minted, of which 61,317 were eventually melted, leaving a net mintage of just 202,928 pieces - less than 4% of the number originally authorized. 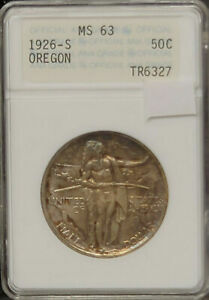 Today, the 14 Oregon Trail issues are often collected as a subset within the commemorative series. 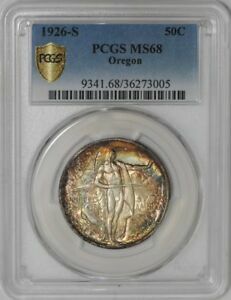 Most are available in the higher mint state grades, many exhibiting attractive toning from years of storage. 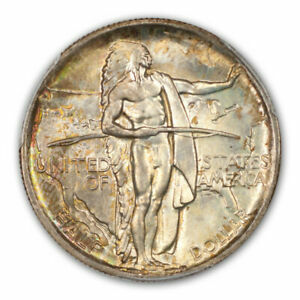 Strike is not often a problem, with the exception of the 1926 Philadelphia issue which was poorly executed, causing a noticeable lack of detail on the Indian's hand. 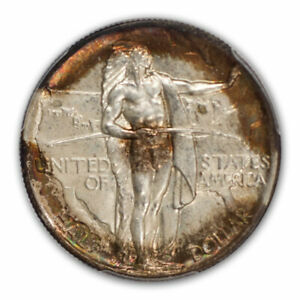 Deep, frosty luster is the norm, but semi-prooflike surfaces on the 1926-S and some branch mint issues of the 1930s are also characteristic. Points to first show wear are the Indian's hand and thigh on the obverse and the ox and the bows of the wagon's cover on the reverse. Oregon Trail halves were distributed in cardboard holders imprinted with the manufacturer's name and, in some cases, the Association's name and address as well. 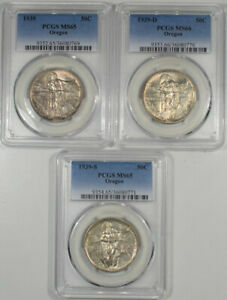 These holders have spaces for three coins and were cut into thirds for single pieces. Typically, original mailing envelopes will show postmarks dated long after the issues were struck.